The design of a new and compact derivative of the Beocord 1100 cassette deck enabled a completely new type of machine to be included in the B&O range, a complete, integrated music centre with three sources. Such machines were of course common from other manufacturers, but for a company like B&O to offer one added prestige and credibility to what could have been viewed as a somewhat derided format. Text copyright © Beocentral. Unauthorised reproduction prohibited. The bulk of the Beocenter 3600 was identical to the Beocenter 1800, itself based on the Beolab 1700, Beomaster 1700 (or latterly the Beomaster 1100) and Beogram 1100. The only changes of any note were that front panel had been made slightly taller (to help disguise the extra height of the tape deck) and that the deck and the platter were anodised black instead of being left the colour of natural aluminium. The latter alteration could not be viewed as completely successful, as despite almost every part of the cabinet being made of machined aluminium, from some angles it may as well have been black plastic, as used in the offerings of lesser manufacturers. The amplifier, radio tuner and turntable shared the same strengths and qualities as their separate counterparts, and offered good quality performance and a nice range of features (integrated FM stereo decoder, 4 pre-set stations, AFC, tape monitor loop etc) despite the limited power available. Loudspeakers such as the Beovox S 22 or S 30 would have been recommended, though in all cases they had to be bought separately. 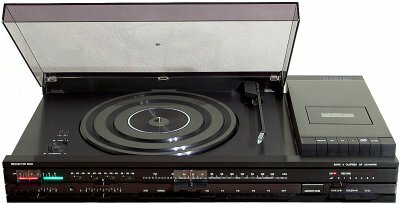 The turntable was fully automatic in operation and was fitted with an MMC 3000 pickup. Text copyright © Beocentral. Unauthorised reproduction prohibited. The real area of interest was the cassette deck. Using the Beocord 1100 as a starting point, a single, compact assembly was produced which could be added to existing models easily. The machine was fully featured and included Dolby B NR, chrome tape capability, electronic auto-stop in all modes, a mono microphone amplifier and a LED level indicator (a first for B&O). This specification was considerably in advance of what the previous cassette sections, such as those fitted to the Beocenter 1400, 1500 and 1600, had offered, and while they could not match the most sophisticated models in the “High Fidelity” range, the performance was still much better that would normally expect from a music centre. Text copyright © Beocentral. Unauthorised reproduction prohibited. Beocenter 3600 was replaced by Beocenter 4600, though the cassette section was carried over practically unchanged. Text copyright © Beocentral. Unauthorised reproduction prohibited.